Make the most out of spring by loading your calendar with great local events like free yoga, visits to unique markets and more. April showers bring May flowers, so here's to hoping for good weather and beautiful blooms all month long. The spring forecast also offers another excuse to catch a ride on The Rapid and let us do the driving, whether it's to get you to work or play. May is jam-packed with a variety of activities all ages will love. Ride the bus to the John Ball Zoo to celebrate the environment, get in some exercise with yoga or a fun 5k or make time to relax outdoors at lunch at Rosa Parks Circle. Save a bit of cash while riding with us to events throughout our service area by buying a One-Day Pass or a 10-Ride Ticket. And don't forget, all rides on the DASH routes and the Silver Line's No-Fare Zone won't cost you when you get on board. Ride Routes 12 and 50 to visit the John Ball Zoo on Saturday, May 6, for Party for the Planet! 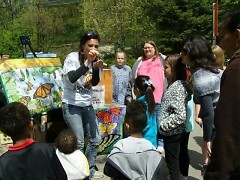 This event is a celebration of conservation, recycling and our natural world in honor of Earth Day. Animals that are threatened or endangered will be showcased with ideas on what you can do to help save these valuable species right here in Grand Rapids. Zookeepers will be doing presentations on the conservation field work they are conducting at our local zoo with talks focused on Piping Plovers, Massasauga, Kirtland’s Warbler, Wood turtles and the migratory Monarch butterflies. Click here to learn more about conservation efforts at the Zoo and how you can get involved! This event takes place from 10 a.m. - 3 p.m. Explore the zoo and meet up with local organizations that are enabling positive methodologies in the conservation. Admission is $10 for adults, $8 for children 2-13 and children under 2 are free. BONUS: We'll be there! Stop by our table. 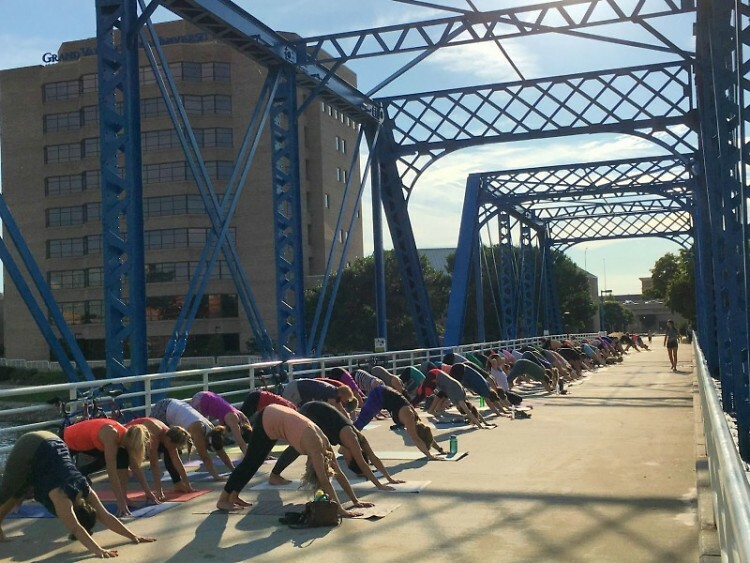 Exercise outside on Friday, May 12, at the Blue Bridge! All you need is your own mat and you can join in on this free, fun event. Routes 9, 11, 12 and the Silver Line to near the Blue Bridge. If you're in for a longer walk, ride any route headed to Rapid Central Station and enjoy the walk over. This event takes place from 6-7 p.m.
Every Tuesday in May, visit Rosa Parks Circle for free lunchtime entertainment. This season, Downtown Grand Rapids Inc. will once again be highlighting a diverse lineup of local bands and large games to play like chess, shuffleboard and Jenga. Upcoming musicians include Avalon Cutts-Jones and Jesse Ray and the Carolina Catfish. Participating food trucks include Gettin' Fresh, What The Truck and Daddy Pete's BBQ. Routes 6, 9, 11, 13 and the Silver Line can get you to Rosa Parks Circle. You can also hop on board a DASH route. 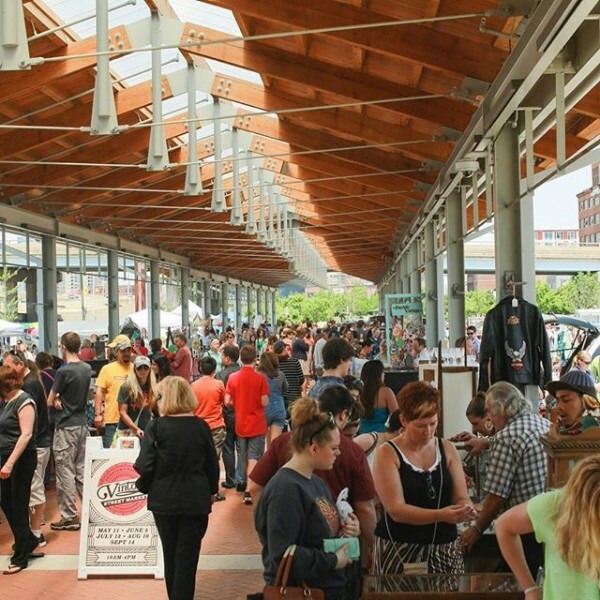 On May 14, ride Routes 1, 2 or the Silver Line to shop to your heart's content at the Grand Rapids Downtown Market monthly Vintage Street Market. Whether you are looking for that perfect couture vintage dress, or a hand painted vintage sideboard, the Vintage Street Market is where you’ll find that exciting treasure to complete your collection. This year’s Vintage Street Market is sure to be bigger and better than ever. Shop from 10 a.m. - 4 p.m. and then enjoy food and fun from other Downtown Market vendors. This free family event to learn about services available in our community at low or no cost. Visit the Kent County Resource Fair at the Boys & Girls Club--located at the corner of Madison and Franklin--on May 18, from 11 a.m. - 2 p.m. Attendees can enter to win giveaways, enjoy light refreshments, resources and connections to community partners. For adults ages 21 and older. This event is made possible with funding from the Centers for Disease Control and Prevention/Hecho posible por Los Centros para El Control y La Prevención de Enfermedades y Kent County Health Connect. Books and brew come together at the KD aLe Book Club. Bibliophiles ages 21+can gather to enjoy some craft beer from Osgood Brewing while talking about what they've been reading on May, 18, from 7-8 p.m. Expert book recommendations from KDL librarians included. Ride to Osgood Brewing on Routes 8, 24 and 28. Ride Route 15 to visit the Grand Rapids Treetop Adventure Park for Glow Night hosted every Friday and Saturday night beginning in May. The suspended obstacle course will be lit up with LED lights and black lights. Admission for adults and kids over 14 years or older is $39, kids 13 and under at $35, while kids 4-6 are $20. Pricing includes three hours of time in the park. Make your reservation today. Visit the Downtown Market to shop Michigan-made artisan gifts, local treats and other goodies. This event takes place on May 27 from 9 a.m. - 4 p.m. After you fill your shopping bags, grab some lunch inside the market hall. Happy May! Enjoy the weather.